For Seattleites, it’s hard to recall a more electric night at the ballet than Friday, November 27. Before a packed and anxious house, the curtain rose for the first time on Pacific Northwest Ballet’s new holiday tradition: George Balanchine’s The Nutcracker™. With original Balanchine choreography and sets and costumes by Ian Falconer, this production is a completely new animal from the one audiences bid farewell to last year. Gone are the romantic pastels of Maurice Sendak’s sets and costumes; gone are the blocky Princess Pirlipat, Rat King, and Nutcracker characters. Instead, viewers were greeted by sets with vibrant, whimsical illustrations imbued with a New England feel and accented with a cute little pig—Falconer is the creator of the beloved “Olivia the Pig” children’s books. If the previous production was a chocolate torte made with exotic spices, the new show is a cake with luscious whipped cream (and lots of stripes!). Both are delicious in different ways; it’s simply a matter of preference. choreographed by George Balanchine © The George Balanchine Trust. The Stowell/Sendak version, with its grown-up Clara and Nutcracker dancers—the projections of a child’s dream self and her handsome Prince—offered a unique story and a compelling evening of theater. 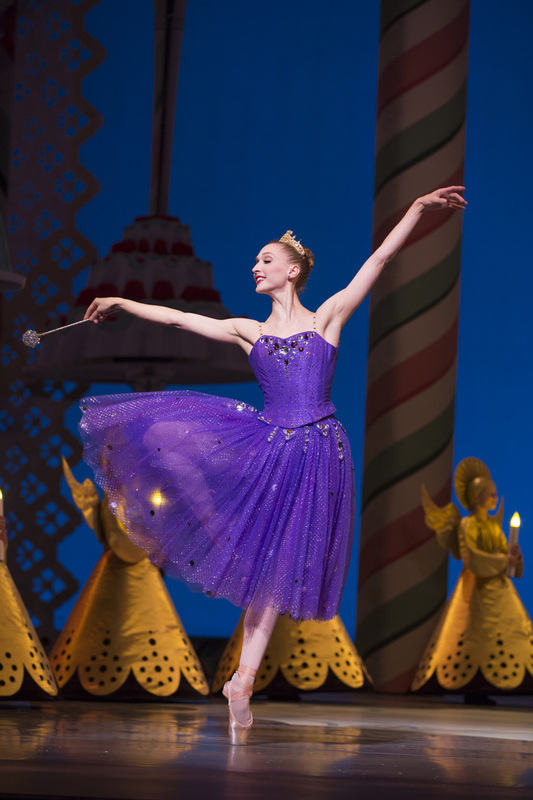 PNB’s new version, however, offers a more classic Nutcracker, Sugar Plum Fairy and all. Gems to be found in PNB’s new production include the genius of Balanchine’s choreography, especially in his design of swirling snowflakes and whirling flowers, and the trust he placed in the highly-capable youth performers. 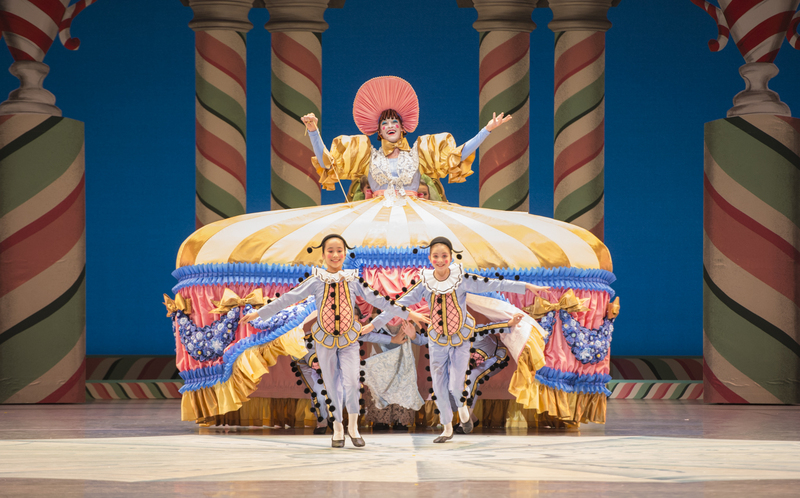 The new Nutcracker offers delectable holiday entertainment for families, ballet lovers, and dance newbies, too. As the overture played, the animation of a snowy night immediately pulled the audience into Falconer’s visual world. The audience got a Santa’s-eye-view of flying over a village during the holidays, before descending upon the Stahlbaums’ grand front entrance. It was then that Santa, well, the audience, was greeted in the film by little mice in an act of foreshadowing. These non-threatening creatures beckoned the audience into a setting where magic was about to take place. As the cartoon ended with Clara and her brother eagerly waiting for a Christmas party to start, flesh-and-blood performers seamlessly replaced their animated counterparts. In addition to Clara (portrayed on opening night by Isabelle Rookstool), stand-out youth dancers included The Nutcracker (Ethan Arrington on opening night), who tenderly placed the defeated Mouse King’s crown on Clara’s head and led her through an enchanted wood with a golden star (created by Dale Chihuly) hanging high above the stage. The eight Polichinelles, all student performers who came bounding forth from the skirt of Mother Ginger, offered virtuosic performing and beautiful technique, as well. Their “mother,” a marvelous Joshua Grant in drag and on stilts, may perhaps offer the second act’s new wow factor in the absence of the treasured Stowell/Sendak Peacock—though for very different reasons. Company dancers across the board offered energetic, passionate performances. This included Elizabeth Murphy, who was promoted to Principal Dancer onstage prior to the show. A vision in purple, Murphy sparkled brightly as the prima ballerina. Unfortunately, she and her Cavalier (the dashing Jerome Tisserand) struggled to find harmony in some of the climactic pirouettes and lifts of their grand pas de deux. Technical problems aside, the pair exuded elegance and danced with a regal quality that made the audience swoon. If Murphy was the Queen of The Land of the Sweets, Laura Tisserand, as Dewdrop, was the Princess. With the long limbs characteristic of a Balanchine ballerina, the charming Tisserand whipped out fouettée turns into attitude arabesque with such command it would undoubtedly make “Mr. B.” cheer. The dolls (Margaret Mullin and Angelica Generosa) and toy soldier (Kyle Davis) in Act I were also standouts of the evening. While smaller roles, their dynamic, mechanical (and in the case of Davis, highly athletic) performances offered a brief and refreshing break from ballet-as-usual. At the end of the evening, these dancers, as well as countless PNB staff, musicians, artisans, craftspeople, set builders, and more were met with a well-deserved standing ovation. If this incredible response was any indicator, Pacific Northwest Ballet has successfully created something to celebrate: a bright new ornament on the tree of local holiday tradition. 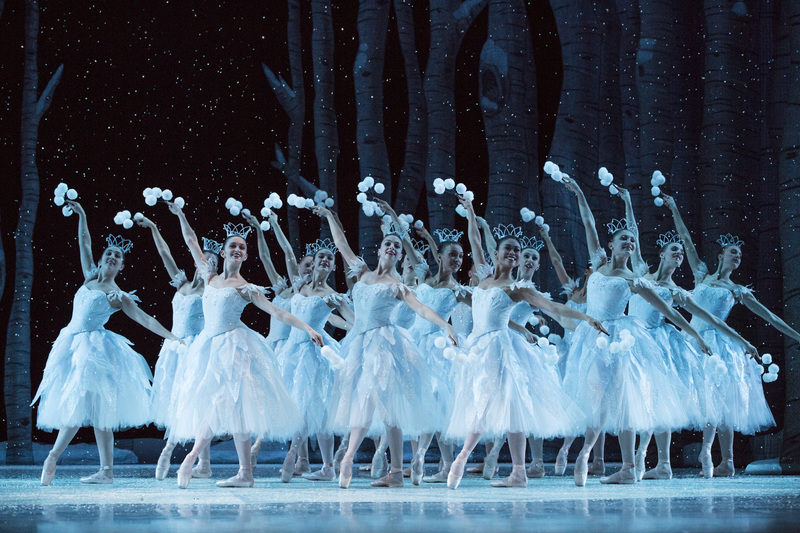 Pacific Northwest Ballet presents George Balanchine’s The Nutcracker™ from now until December, 28 at McCaw Hall. Tickets and information are available at pnb.org. The Sendak/Stowell version, “Nutcracker: The Motion Picture” can be purchased or rented here.